One particular statistic from the Swedish internet use report for 2011 was how everyone in Sweden in the 16-25 age group uses social media. For a fair while we’ve been discussing the expectations of young employees in the workplace, but this statistic is about as big as a wake-up call as an organisation can get. It’s time for companies to stop slacking, pull their intranet socks up and get social. Let’s paint a picture. Jesper is 25. Not long out of university and has spent pretty much as long as he can bother to remember using MSN instant messaging, texting, and socialising with his friends via Facebook. All the time. He’s been receiving constant feedback, answers, and opinions around the clock. At the same time he’s been giving feedback, answers and opinions to his peers around the clock. It’s a totally natural part of his life. A digital native. So what happens when he enters the corporate world and sits behind his laptop at work? He replicates his natural behaviour outside of the workplace. He expects to be able to network with his colleagues and his professional contemporaries in the same way as he does naturally outside of work. But your organisation hasn’t embraced social business. The intranet is still a place for pushing news articles from internal communication. Facebook access is blocked. Internally, email is still the king. Jesper is starting to regret accepting this job and realises that next time, he’s going to do his company culture homework a lot better. He then pulls out his iPad from his bag and opens up all his normal social networks, invites all of his colleagues to be friends, or follows them, or connects with them and starts working. Circumnavigating your attempts at blocking sites, working outside of your firewall, he has filled in the gaps. It doesn’t matter any more whether you think it’s a good idea to have a social intranet, or haven’t budgeted for one – the digital natives in your workplace are going to network regardless. Providing social and collaborative tools inside the firewall (or within the realm of the organisation) will help you retain some of Jesper’s knowledge though his social behaviour and turn it into a digital asset for your company. James Royal-Lawson+ is a digital strategist, web and intranet manager based in Stockholm Sweden. This blog post was born over a beer and a chat in Stockholm with intranet pioneer Mark Morrell and Martin Risgaard, Social Media Strategist at Arla Foods. .SE (Stiftelsen för Internetinfrastruktur) has released their yearly report (in Swedish) about Swedish internet use. It covers a wide spectrum of internet use, from file-sharing through to social networks. 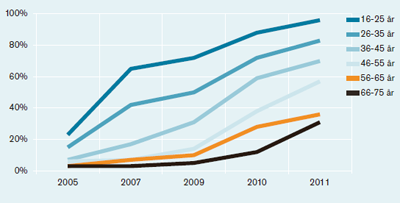 I’ve previously written about the 2009 report with specific focus on Swedish blogging statistics. This time I’m going to give a more general summary of interesting findings from this year’s report. 86% of the Swedish population over the age of 18 use the internet. This has risen by just 1% in the last year. Additional people are still coming online, but they are largely limited to the over 65 age group. In 2011, 69% of adult Swedes are using the internet daily. Amongst Swedish internet users, two activities are so widespread that they could be considered to be done by everyone. Those are searching using Google (97%) and reading/writing email (95%). Searching for news (92%) and timetables (90%) are not too far behind in their popularity. 49% of three year olds are occasional internet users (64% within the 3-5 age group). The age-group in which the majority have used the internet has become younger year after year. That the “start age” for internet use has reached such a young age as three is perhaps connected to the rise of smartphones and the mobile internet, as well as tablets such as the iPad. More intensive internet usage – that is to say daily usage – amongst 3 year-olds has remained relatively constant (2-3%) during the past 3 years, whereas it has risen for every other age between 4 and 9. 46% of internet users read blogs (up from 37% in 2009), with 8% writing a blog (up from 6% in 2009). 16% of women and 5% of men read blogs daily. The number of young girls reading blogs has increased dramatically in recent years. 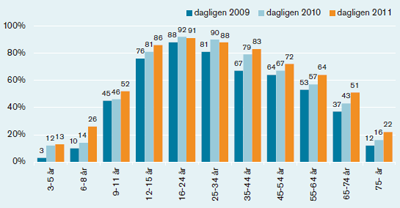 52% of Swedish girls between 12 and 15 read blogs daily. The equivalent figure for 12-15 year old boys is 1%. Blog reading is predominately a female activity for every age group until the age of 76+. Reading blogs on a daily basis is overwhelmingly a female activity from 12 year-olds up to 45 year olds. Half the population, 52%, use social networks. All of them have a Facebook account. This figure has increased 10% each year in recent years, and shows no signs of slowing. In the 16-25 age group, the use of social networks has reached the point where you can say that pretty much everyone in that age group (95%) now uses social networking. 35% of those who use the internet use social networking sites daily, with Facebook obviously dominating. 7% though said they have used Twitter at some point, with 2% saying that they use it daily. The age group that dominates in so many of the statistics in the report, is the 16-25 age-group. This generation is undeniably the digital generation. Many activities and usage patterns of this group can be routinely described with phrases such as “everyone” or “majority of”. Despite high overall levels of adoption, the internet in Sweden is far from being a level playing ground. This is important to bear in mind in your digital activities. Swedes and the Internet 2011 has now been released in English. QR codes are nothing new. They are a form of 2D bar code invented (and patented) by Denso in 1994. They’ve been huge in Japan for years, in part because of their ability to encode Japanese Kara.